One of the most exciting aspects of Force Friday is new Lego sets! The sets from the Last Jedi do not disapoint in this regard. Buy your Legos here. Toylab is a member of the Amazon Affiliate program allowing us to create a window from our site right into the Amazon Retailer. All the great deals of Amazon are just a click away and we have done the work of finding the best values for your wallet. Below are the best deals we found on the Star Wars: The Last Jedi Lego Sets. So many cool new sets! 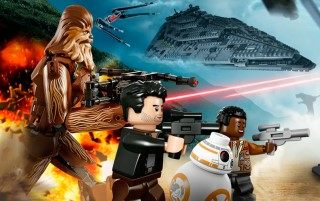 There are variety of new Lego sets for Star Wars the Last Jedi. Many include both new vehicles and new characters. Lets check them all out! Lets start out with my favorite new set. This Transporter Pod includes Finn, BB-9 and Rose Tico. Rose Tico is a new character that will appear in the Last Jedi and this is the first set to have her in it. In the film Finn and Rose will be going on a special undercover mission on the Casino Planet of Canto Bight. I think this small space ship looks really cool, for its size I just think this offers a lot of value giving 3 main characters and a cool looking space craft. This is another set I think will get a lot of focus. The ship is big beautiful and you get a bevvy of Resistance fighters to go along with it. Also another characters make her first appearance here in this set with the purple haired Admiral Hondo. Poe Dameron also appears in this set along with a big group of resistance fighters. This is another cool smaller set. It provides a new walker some troopers and General Hux. This set also comes with a special flame thrower type of First Order Trooper which looks pretty cool. The resistance fighter here looks very outgunned. Kylo Ren appears in this set without a helmet. The Tie Fighter looks fantastically foreboding with a dark red colored cockpit. Also appearing in this are some First Order Troopers and the brand new BB-8 doppelganger the evil BB-9E. I reallyjust like how this this thing looks its sleek, and sinister. It might be the most intimidating fighter ship in the Star Wars series ever. This set comes with a new beefed up version of the Walker. This is also the set that comes with Rey this time bearing a lightsaber. It also features a different version of Poe Dameron.